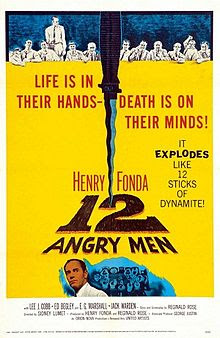 For this week's Deucecast Intermission... three jolly, chunky, geeky, goofy, attractive, dorky guys take on 12 angry men... that is, "12 Angry Men ", from 1957, the movie that lost to "The Bridge On the River Kwai" for Best Picture. The film is a limited storytelling movie with 12 men sitting around the jury room, deciding the fate of a minority defendant, on trial for the murder of his father. All seem to want to convict, though one juror demands they stay and talk it out... and thus, the story unfolds. In a great Intermission, the guys discuss the complexities of the film, including juror by juror, likes, dislikes and a great comparison to the 1997 update with Jack Lemmon and George C. Scott. Enjoy this Intermission, and then go watch this classic film!